Your student lives, eats, sleeps, breathes, and dreams martial arts. She wants to attend every seminar, every class, every tournament, and every event. He wants to learn about advanced patterns, sparring, grappling, weapons, and watches every martial arts movie possible. Your student is a “Lifer” and we want to recognize their hard work, dedication, and determination by taking them under our wings for some extra training and opportunities. This is our Black Belt Apprentice Program. 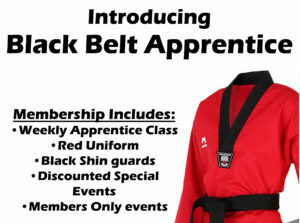 What is Black Belt Apprentice? Once a student achieves the level of Green Belt, they enter our Black Belt Apprentice program. This program is for students who love training and are committed to achieve their black belt. Our Black Belt Apprentice program isn’t another program for you to try to schedule into your week…it is their program at green belt. Students in the Black Belt Apprentice Leadership Program will not only continue their martial arts training to earn their black belt in Taekwondo but we begin to add material from other martial arts to their training regimen. Inclusion in the Black Belt Apprentice program comes with a number of fantastic benefits. What additional martial arts will be be practicing as a Black Belt Apprentice Leader? We will primarily stick to Taekwondo but there will also be the addition of Judo and Brazilian Jiu-jitsu in the form of throws and ground work. Okinawan Kobudo from the Ryukyu Kobudo Shimbukan will be added to the curriculum as well in the form of basic actions and beginner training forms. Starting in October of 2018, on Thursday evening from 6:45 to 8:15 BBA Leadership team members will be able to participate in our optional Olympic-style Taekwondo competition team training sessions. The competition team will practice Olympic-style sparring, sport pooomsae, traditional and creative weapons, and competitive board breaking. The team is open for only Black Belt Apprentice Leadership program members or invited students. It is only an additional $45 per month. It will include all the weekly 90 minute training sessions as well as any pre-event tournament prep opportunities. It also includes a customized strength, conditioning, and stretching program for each athlete. The competition team is focusing on the 2019 USA Taekwondo National Championships to be held in Minneapolis in July 2019.